X8 MIG Welder’s most powerful power sources are now available for customers. The new X8 Power Source 600 and its multi-voltage version (600 MV) provide extreme performance and accuracy up to 600 A. Many useful functions have also been added to the system, including a free-of-charge double process functionality. In addition, X8 MIG Welder now supports a new Digital Work Order feature, enabled by native connectivity with WeldEye welding management software. X8 Power Source 600 / 600 MV deliver 600 A at 40% duty cycle, and 440 A at 100% duty cycle. Together with a new water-cooled welding gun, X8 MIG Gun 600-w, they extend the use of X8 MIG Welder to even the most challenging heavy duty industrial welding applications. All X8 Power Sources are similar by structure, but their power class can be changed digitally. Thus, any previously purchased X8 Power Source 400 or 500 models can easily be upgraded to the highest power class by purchasing a power upgrade package from Datastore. 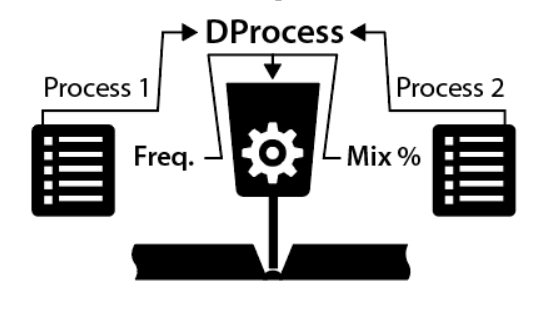 DProcess is a new, free-of-charge double process functionality that has been developed for the X8 MIG Welder to expand the use of previously released MIG welding processes. It lets the user combine any two welding processes to achieve optimal welding characteristics. DProcess is a standard feature in all new X8 MIG Welder systems, so the user needs to purchase only the welding programs and Wise processes to be mixed. Current X8 MIG Welder owners are able to activate the function through DataStore. Digital Work Order is a new feature of WeldEye to be used with X8 MIG Welder. The digital work orders are managed with the WeldEye for Welding Quality Management module, and can be sent directly to the welders' X8 Control Pads for processing. You can also attach a digital WPS (dWPS) to the digital work order. The implementation of digital work orders requires ERP integration, which is always handled on a project basis with each customer.